Break-ups are almost never pretty, but two Chinese students have managed to melt the hearts of millions around the world, with their romantic break-up ceremony. Xu Minyu and Xiao Ying, two students from Wuhan’s University of Science and Technology, had formed a couple for the last four years, and even though everything was great between them, they decided to break up upon graduating college. It wasn’t an easy decision for either of them, but they both agreed their careers were more important at this point in their lives, and a long distance relationship just wasn’t going to work. Xu Minyu will join the civil service in Hangzhou, while his girlfriend, Ying, has already signed a contract with a Beijing-based company. This puts 1,200 km between them and makes a normal relationship impossible. But, unlike most couple who usually just decide to simply put an end to their relationship, or worse, have a terrible break-up fight, the two students decided to commemorate their love with a memorable with a memorable ceremony. 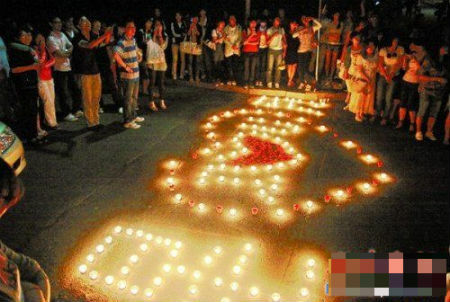 It all went down last Thursday night, when, surrounded by burning candles and a crowd of fellow students, Minyu went up to his beloved girlfriend, carrying a bouquet of 99 roses, got down on one knee and asked for a break-up. Just like during a wedding proposal, the crowd shouted “Say yes, say yes”, and after a two-minute silence, Xiao Ying accepted the flowers and the proposal. Xiao Ying always used to tell her boyfriend how much she loved romantic proposals, and even though a romantic break-up wasn’t exactly what she had in mind, he thought it was the most appropriate way to end their relationship.